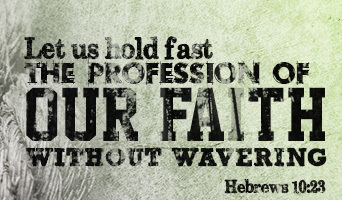 Hold fast to your profession of faith in Me and My infallible Word, says the LORD, for your steadfast faith pleases me. Be steadfast and unshaken by the circumstances of life as you focus you attention upon Me. I created you; I will take care of you. I will provide for you. You are in My hands and you are not alone. Look to Me and let faith arise in your heart. Let high praises resound from your lips. For I have not forsaken you, know the way that you take, and you are not forgotten. I watch over My Word to perform it. I cannot lie or change My mind, purpose or plan. Your destiny is still before you, unchanged, and you will have what I have spoken, do what I have called you to do, and you will be a profitable servant in My kingdom. I never change strategies to fit your circumstances, but they must bend to My will. I AM never shaken by them and nothing takes Me by surprise or causes me to be distracted or off guard, says the LORD. Be vigilant in My Word and Will and Work and understand that as you do one, you do all, for they are in total agreement always, says the LORD. For I speak what I will, and perform what I say. I cannot change My higher ways and thoughts but I will change you as you are pliable in My hands that created you. Then you will not only be provisioned for every good work that I have authored you to do, but you will be ready, equipped and enabled to be all that I have created you for. Your destiny is your purpose and it is not behind you. As you press into My presence, you will also be pressing forward in your destiny, for they too cannot be separated. Come closer and let Me download new things within you that will prepare you for the place that I have for you. Nothing is wasted and your times are in My hands. Failed harvests of the past will only fertilize the soil for the bountiful harvest ahead. You will forget the former things in light of the harvest to come and I will use you for My glory, fulfill your kingdom purpose and give you more than you could ever ask Me for or dream of, says the Lord. Amen! Glory to my Father! Amen! May the name of the Lord be highly glorify. God is ministering to our hearts in a very devine manner,what a good message we receive for such a time as this? be blesd.thank you. Glory, Glory, awesome Abba, for your words this day. I receive them in joy. Amen !